Over the years I have used many different password managers. Being a nerd and working in I.T. I have a lot passwords to keep track of (well over 250). All unique, all complex. I don’t have the memory of an elephant so remembering all of them is out of the question. In this article I will discuss how I manage them effectively. A long time ago I recognized the need to store passwords somewhere safe. At the time there were not many applications, if any, for storing this information. I started out using a password encrypted Excel spreadsheet. This worked out fine because I mainly needed it for work anyway. Once I needed to manage passwords for home as well the spreadsheet solution didn’t work that well for me. There were a few password managers out then, but I wasn’t sure I trusted any of them, and didn’t want to pay what they were asking. So I did what all coders would do, I wrote my own. In comes KeySafe with RC4 encryption. At the time I was using a mix of platforms so I needed it to work across all of them (Mac, Windows, and Linux). All I had to do was copy the encrypted file between the computers. I had intended to sell it as shareware, but never did. That worked for quite a while, but it became increasingly difficult to remember which computer had the latest encrypted file. I sometimes inadvertently replaced the most current with an older one and ended up losing a password. A lot had changed since I first wrote it and I could not get it to compile any changes without significant effort and re-writing. So I chose to look for a new alternative. I tried several different password managers including mSevenSoftware mSecure, Acrylic Software Wallet, (OpenSource) KeyPass, and several others. There were things I liked about all of them as well as things I didn’t like. I should state that the browser’s password management feature was not an option since I also store non web based passwords. Ultimately I chose Acrylic Software Wallet. It had excellent aesthetics and an iOS application which could sync to the desktop. It didn’t support Linux or Windows. Linux didn’t matter that much any more for me, and I thought I could make do without the Windows side since it had an iOS companion. This worked very well until July 2012 when the author announced it would no longer be developed as he was taking a job with Facebook. So the search began again. Must have an Mac OSX desktop application. Must have an iOS application. Which must allow a master password for unlocking and not a crappy 4 digit pin (these can be hacked inside 45 minutes). Must have a Windows desktop application (yes I was tired of looking everything up on iOS and having to type in long complicated passwords). Must have the ability to intelligently sync between them. Must not be cost prohibitive once purchased for all needed platforms. By this time I had started using LastPass as an augment to Wallet. I still maintained every password in Wallet, but used LastPass to do automatic form filling (user name / password) for web sites. The LastPass goal is to be the last password you need. Very strong encryption, and you can use it across browsers and across computers. Login once and it remembers, so the next time you don’t have to type in or copy/paste the password from a password manager. Very nice indeed. Wallet had this ability but it was only for Mac OSX so I didn’t use it. After several email exchanges with each of the publishers and a spreadsheet showing pro’s and con’s of each password manager I chose SBSH SafeWallet. It had everything I was looking for and was cheaper than the rest. AgileBits 1Password was a close second. SafeWallet served me well, until… They announced in early 2013 they were changing how sync worked – moving the sync mechanism to their servers and disallowing the existing sync methods. While this normally wouldn’t cause me much grief, I don’t like it because SBSH is based in Tel Aviv, Israel. They say their servers will be in the United States, but who knows what they could/would do behind the scenes. I’m not saying it’s a risk. I am saying that I, personally, am not comfortable with that move. Back to the drawing board. 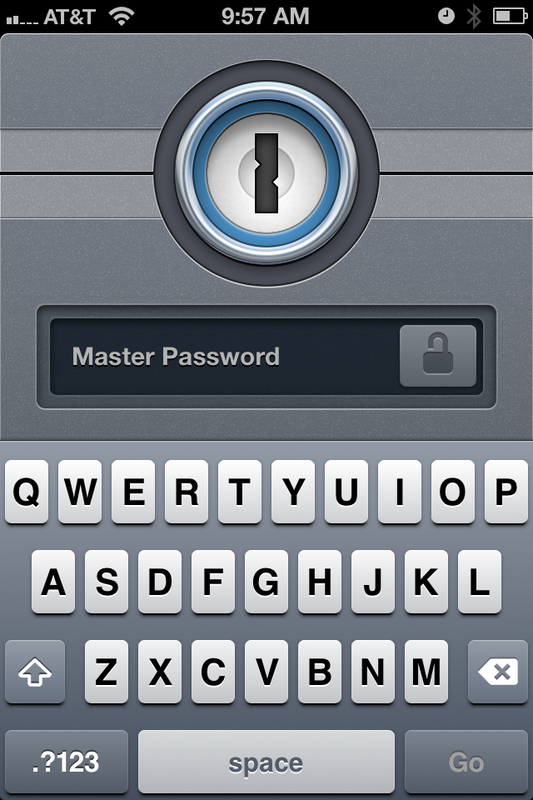 Since it was so recently that I moved to SafeWallet, I only chose to look at my second choice – AgileBits 1Password. I didn’t choose 1Password before because it allowed login with only a 4 digit pin, then a master password to open select items. I asked some friends that were using it how they liked it and received good feedback. I emailed their support to get a feel for the iOS app since there is no trial. I found out they now had the option to not use the 4 digit pin. They also sell bundles which reduces the overall cost. Sold! I recently completed the transition from SafeWallet to 1Password and couldn’t be happier. It even has web browser plugins that do the form filling (username / password) just like LastPass. So I no longer need LastPass. When you launch the Mac OSX desktop application you are presented with a lock screen. You enter your master password to unlock it. Once its unlocked you have access to all web passwords, system logins, secure notes and whatever else you’ve securely stored in it. You can manage the passwords in multiple ways. I use folders and tags, both of which are optional. I use tags as a means to categorize and find items relating to a specific subject (ie: work, personal, career, etc). The items may be a mix of web sites, system logins, notes, etc. Click the tag and see everything related. Each item can have multiple tags if applicable, unlike folders. An item can only be in one folder. I use folders as a means to categorize and find items similar to tags but on a more granular level (ie: work web sites, career web sites, personal web sites, finance web sites, work system logins, etc). One could argue this could be done with tags as well and not use folders. In the end it’s your choice – whatever works for you. Enter your master password to unlock it. Visit a website you need to login to, click the key icon again and be presented with the choices that match. In this example I went to Google Mail and 1Password recognized three account options. I click the one I want and it fills in the details. It can click the sign-in / logon button for you but I choose to do that myself. If you are creating a login for a new site you can use 1Passwords builtin password generator. It can create complex passwords with ease. Click the key icon in the browser button bar to bring up the 1Password dialog, then click the icon that looks like the dial on a safe. Adjust the parameters as necessary. Click Fill when you are satisfied and 1Password will populate any password fields on the web page you are viewing. Once you click the login button on a web site, if it does not know the credentials for that site it will ask if you want to save the ones you entered. This prompt will be in a bar at the top of the web page you are viewing. You can alter the name it suggests, then click the Save button. If you don’t want to save it, click the X icon. Now it will appear in the desktop application where you can tag and folder it how you like. As a safety precaution, ALWAYS logout of any website you login to! Now you’ve seen the Mac OSX desktop side. The Windows side is not as pretty but functionally the same. I’m told by the developer that a new version is in the works. I know this sounds like an advertisement for 1Password, and it sort of is, though I get nothing in return. It is simply an outstanding product and gets my full endorsement. It is very secure, has very strong encryption, pleasing aesthetics, seamless syncing, and many other options. Now I only have to remember the password to get into it! With all the advantages that come with a smart phone, there are also some big disadvantages. The biggest is data usage. If you have an unlimited data plan this article is not for you. Here I will show you how to conserve it. First lets hit the obvious one. Apps and cellular data in general. iOS has a setting that prevents apps from using data when on a cellular network. Great! Or so you think. There is a drawback. If you disable data over cellular you will not be able to send picture messages while on cellular or Wi-Fi. If you still want to turn off data over cellular, open Settings, General, Cellular. Next to “Cellular Data”, move the slider from ON to OFF. Do the same for “Data Roaming”. Next let’s address iMessage. That’s right, iMessage for any and of the benefits it gives to messaging, it also has a dirty secret. It uses your data plan to send and receive instead of your carriers SMS (text messaging) plan. Many of us have unlimited text messaging (especially if there is a teen in the house), but not unlimited data. In this situation iMessage can work against you. Take control of iMessage by turning it off. Open Settings, Messages. Next to “iMessage”, move the slider from ON to OFF. If you do turn it off and decide to turn it back on, you will have to sign back in to the Apple account used by iMessage, which could potentially be different from the account used for iCloud depending on how and when you set them up. We’ve tackled the big ones, now lets look at a few others that could potentially run your data usage up unknowingly. The next one that can cause some pain is the automatic download of Music, Apps, or Books. Open Settings, iTunes & App Stores. You can leave the individual settings turned on so they will work when you are on Wi-Fi. Next to “Use Cellular Data” move the slider from ON to OFF. Next up, FaceTime. Your carrier may not allow FaceTime over cellular. In that case you don’t need to worry. If it does and you use FaceTime, you can set iOS so it won’t allow it over cellular. To turn it off open Settings, FaceTime. Scroll to the bottom . Next to “Use Cellular Data” move the slider from ON to OFF. The final piece I will cover relates to Safari’s Reading List (which allows offline reading of web pages). If you don’t use Reading List this won’t apply to you. To turn its use of cellular data off then open Settings, Safari. Scroll down to Reading List. Next to “Use Cellular Data” move the slider from ON to OFF. With all these settings complete you should start seeing a decrease in your cellular data usage. Your mileage may vary. You can check your usage daily by opening Settings, General Usage, Cellular Usage. Look at the “Cellular Network Data” section and note the Sent and Received values. These are cumulative until you reset them with the “Reset Statistics” button at the bottom. Hopefully this will help you take control of your data usage. Delicious is a great web-based bookmark site where you can easily categorize and find a bookmark via tags. It also has a number of social features for sharing and discovery. Or, it used to be. Delicious was owned by Yahoo! until April 2011. Since then the service has become slower, constantly logs me out, and changes my default sort order to count (even though I repeatedly set it to alpha). For these reasons and the fact I’m not using it for its social aspects, I decided to move away from it. I know I wrote about it recently, touting its benefits, as part of the Breaking from Google Series here. The writing was recent, I actually did the move some time ago but wanted to present it as an option for migration because it could still be great if they fix a few problems. It’s still a great idea, but I think it’s having tremendous growing pains. A while after migrating to Delicious, I found myself once again looking for alternatives. I looked at a few different bookmark sites and was not impressed with any of them. None work like I want them to. My main criteria is ease of access, and portability so they can be accessed across multiple devices regardless of platform. I don’t need a lot of bells and whistles and would like them available online and offline. Since I use Apple products, part of the solution was staring me in the face – iCloud with Bookmark synchronization. It works great to keep an organized (via folder) list synchronized across all my Apple devices. Though there is one trick to setting them up so they are easily traversable under Safari on iOS. More on that in a bit. This will sync bookmarks across all iOS Safari, OSX Safari, and with Firefox (Chrome or IE) on a Windows device. It uses iCloud to manage the OSX and iOS synchronization. It uses XMarks to manage the synchronization from OSX to Windows. XMarks is a web-based bookmark synchronization tool. By itself it is nothing special, to me. Its power lies in its browser extensions which allow synchonization not only between browsers, but also between different browsers on different operating systems. This company nearly fell into obscurity but was saved via purchase by LastPass in December 2010. So if you add/delete/change a bookmark on iOS, you must open Safari on OSX to get the changes to propagate to Windows, and vise-versa. OSX is the go-between where both iCloud and XMarks run. XMarks does have an iOS solution but it is not free. To get the structure to replicate and where it’s easy to navigate, you have to create it in a certain way. From an OSX desktop running Safari, organize bookmarks so they appear under Bookmarks Menu when you view “Bookmarks > Show All Bookmarks” (should be the 3rd item down). They can be organized into folders and subfolders however you like, but must appear under the “Bookmarks Menu”. Once organized there, they will appear (as you organized them) under the Bookmarks menu. When viewing the bookmarks in Safari on an iOS device, you must select the bookmark icon, then “Bookmarks Menu”. Safari will remember this the next time you open bookmarks. You can use the breadcrumb to navigate backward if needed. Safari displays it slightly differently between iPhone/iPod and iPad. Safari uses a drop down on the iPad because there is enough screen real estate. Awesome! We now have bookmarks synchronized across Apple devices, but we also want to synchronize that list to a Windows PC running Firefox (or IE or Chrome). That’s where XMarks comes in. On the OSX desktop Mac, install XMarks from http://www.xmarks.com. It should prompt to run the installation wizard. If you don’t have a free account, create one. When prompted, select the option to sync bookmarks from local to server (Safest). Open Safari and go to http://my.xmarks.com, login if needed. Validate you see your bookmarks. If you don’t, open System Preferences > XMarks > General and click “Synchronize Now”, then refresh the browser page showing my.xmarks.com and validate the bookmarks are there. On the Windows PC running Firefox (or Chrome or IE), install the appropriate XMarks browser extension or application. Before running through the setup, make sure you don’t have any bookmarks that are already in your synchronized bookmark list. Run through the setup wizard and select Merge data (preserve server). On the Windows PC, open the browser and validate the bookmarks are present just as you did on the Mac by logging into my.xmarks.com. This introduces one small annoyance which can easily be ignored. XMarks will pull in a few bookmarks like “Recently Bookmarked”, “Recently Tagged”, and “Bookmarks Toolbar”. They will populate across all the devices. Just ignore them, or use them if they suit you. Now as you add and remove bookmarks and they will populate across devices!